Shunned By Shooting Victims' Families And Politicians Of Both Parties, Trump Arrives In Pittsburgh To Protests - Joe.My.God. Local and national officials are declining to appear with President Donald Trump on Tuesday as he visits a grieving Pittsburgh, where funerals for slain congregants at the Tree of Life synagogue were beginning. Trump, accompanied by the First Lady and prominent Jewish members of his administration — including daughter Ivanka, son-in-law Jared Kushner and Treasury Secretary Steven Mnuchin — arrived in the stricken city just before 4 p.m. ET. He was expected to visit with wounded law enforcement officers and pay respects to the dead amid ongoing funeral observances for the mostly elderly victims. He was due back in Washington in a matter of hours. Senate Majority Leader Mitch McConnell, House Speaker Paul Ryan, Senate Minority Leader Chuck Schumer, and House Minority Leader Nancy Pelosi were all invited to join the President but were not planning to take part in the visit, according to two congressional sources. Through their offices, McConnell and Ryan both cited scheduling conflicts. 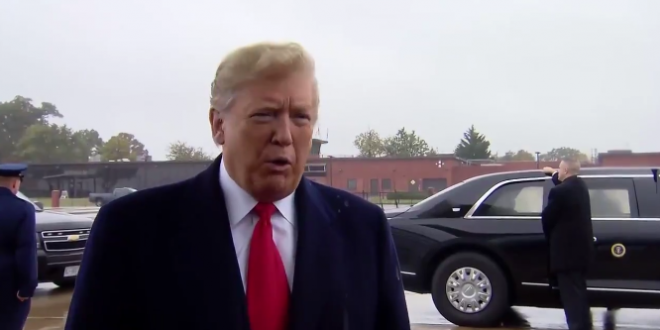 President Donald Trump arrives in Pittsburgh as people gather in Squirrel Hill to oppose his visit in the wake of the Tree of Life shooting.